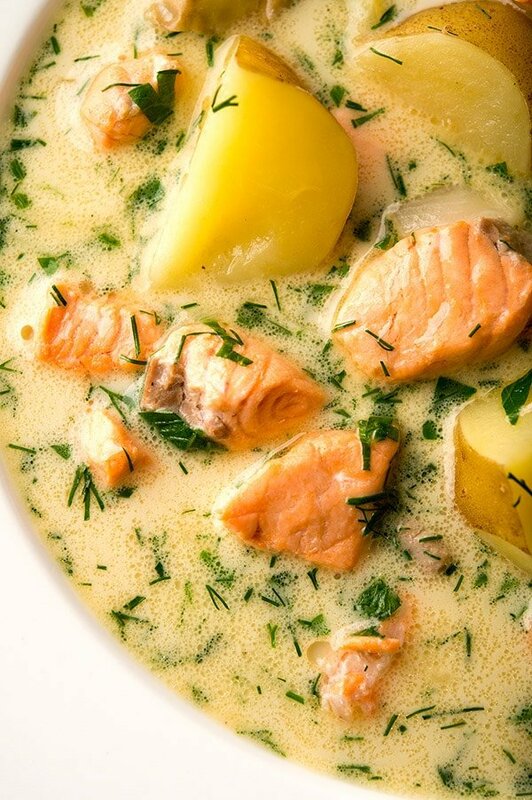 This lovely salmon soup from Iceland is something of a cross between a chowder and a soup, with just a touch of dairy. It’s warming and comforting without being overly heavy, which I like. 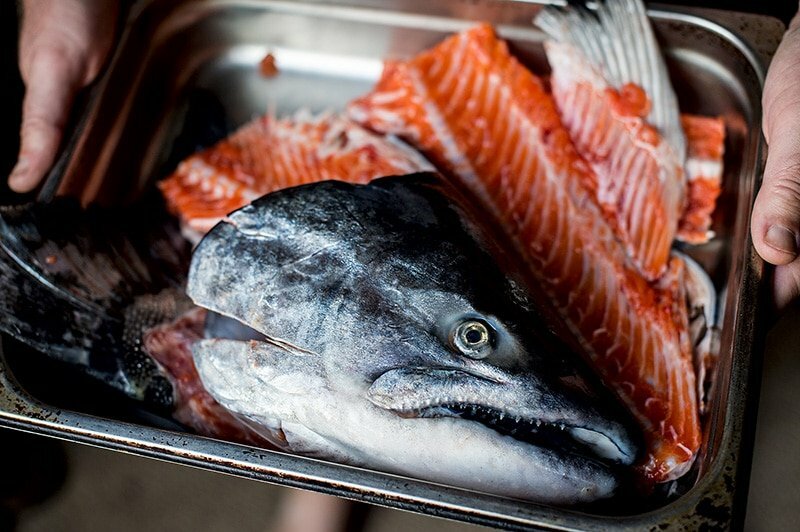 And what’s more, it can be made quite well with the meat left on the racks of salmon or trout, so you waste less. by Nanna Rögnvaldardóttir. Iceland still has good populations of Atlantic salmon, but of course, being in California, I use our local chinook salmon instead. Any salmon or large trout, or several smaller trout, will work for this recipe. You start by making a broth with the salmon bodies. I know, most cooks will tell you not to do this because salmon broth will be strongly flavored. But this is a salmon soup, and you’re not storing the broth for more than a couple days, so you won’t get that awful “salmon stink” everyone knows and hates. After the salmon makes the broth, you pick off the leftover meat and reserve that for the finished soup. A few root vegetables or potatoes go in, and when they’re done, add a little cream, a few fresh herbs, and you’re good to go. There is one special ingredient that really makes this soup, however: whey. This tart byproduct of cheesemaking adds the brightness that this soup needs — it’s a common ingredient in Nordic cooking, one I’d love to see more Americans use. How to get whey? Easy. Buy some milk and make some homemade ricotta cheese. (Here’s how to make ricotta cheese at home) You can then use your ricotta any way you’d like, but I might suggest using it in venison lasagna. Of course, you can skip the whey if it’s too much trouble. But it does make this special. 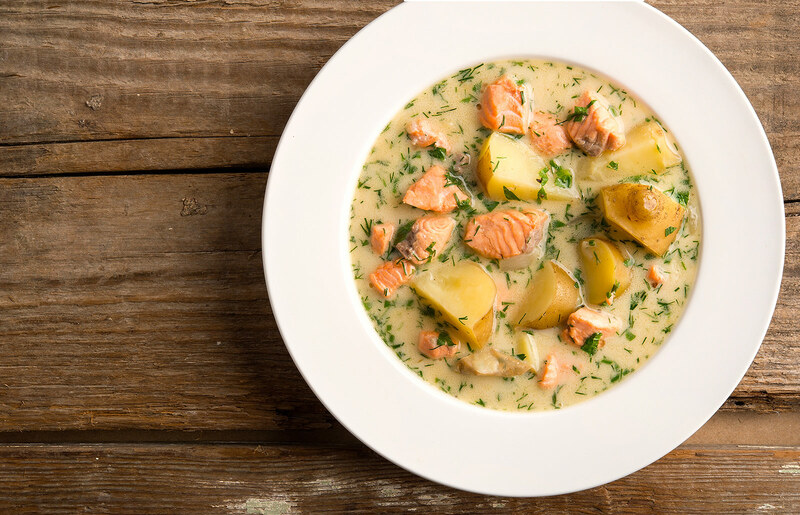 This is a simple salmon soup that uses salmon bodies to make a quick broth, then meat picked off the bones for the soup itself. Any salmon, trout or char works well here. I like this soup with crusty rye bread. Bring all the broth ingredients to a boil in a large pot. Drop the heat below a simmer and let this cook gently for 30 to 45 minutes. Strain and keep warm. Pick off salmon meat and reserve. In a soup pot, heat the butter over medium-high heat and cook the sliced onion until wilted and transparent, but not browned. Pour in the broth and potatoes, bring to a simmer and add salt to taste. Simmer gently until the potatoes are tender. Add the salmon, either picked from the bones or freshly diced, plus the herbs and heave cream. Let this simmer 5 minutes. With a ladle in one hand and a whisk or fork in the other, slowly ladle some hot broth into the egg yolks, all the while whisking the egg yolks. You want to temper them so the yolks won't curdle in the soup. Whisk in another ladle, then one more. Pour this into the soup, stir well and turn the heat as low as it will go. Let this worm up a minute or three, then serve at once. 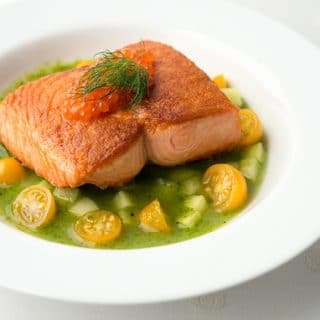 You’ll find all sorts of other recipes for salmon and trout here on Hunter Angler Gardener Cook! We made it with trout, it was excellent! Thanks for the recipe! Not so special. The soup taste good, but i can not tell what the uniqe iceland flavor is. We just got home from visiting Finland and I wanted to make the salmon soup we had in Lapland. This was perfect. 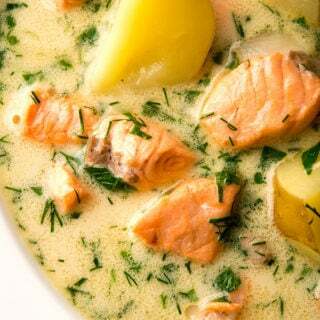 The salmon broth and herbs makes it so wonderful…and the egg yolks at the end of the recipe! We loved the soup with a hot loaf of crusty sourdough bread.